I've been working with a lot of families and children - in fact, it seems that I specialize in infant and family photography since leaving the wedding cash cow state that is Utah! Children can be so tricky to work with as they're unpredictable and following direction from a stranger - ha, if they won't follow it from mom and dad, what shot would I have? Believe it or not, there are tricks to getting kids, your kids even, to focus during a shoot. Here are a few things I've picked up along the way. As I said - they're unpredictable. One trick doesn't work just travel down the list! Bring your car keys! Holding and shaking keys next to your camera or in the direction your getting your subject to look is a great way to get their attention. Depending on the age you may even get some smiles and giggles out of it! SQUEEZE! A trick I often use is to ask siblings to give each other a hug. Have you seen how unnatural that looks? However - if you make it fun, like "See who can squeeze each other the hardest. Quick! Oh, I think Sarah is winning! Harder!" Suddenly the natural smiles come out, playful laughter, and you get that "mushy" moment without the posed feeling. "Squeeze" is exactly what you see happening in this image. 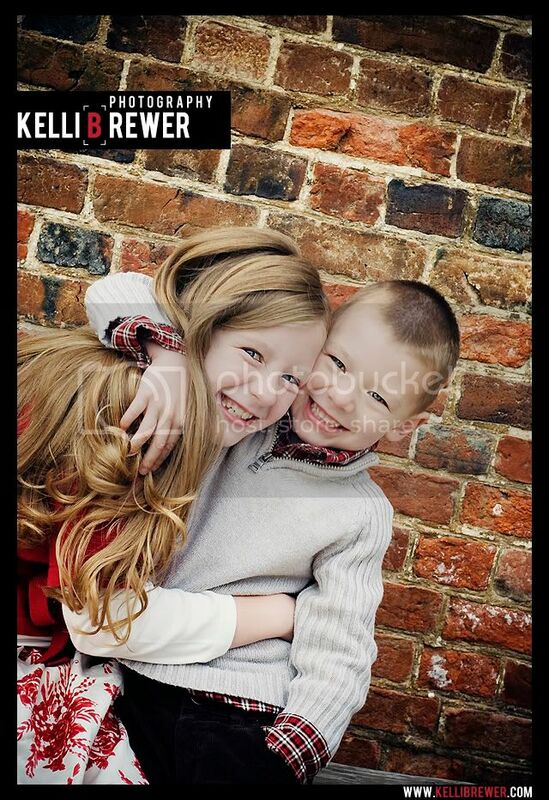 Their mom Heidi commented that this is one of the few photos that really captures their "real" smiles. Such an easy trick! Let them play! The more dictating being done, the less and less fun a shoot becomes. I tend to like to let kids run around and explore. When I see a moment I might ask, "Brooke, look at me." I capture the moment as it happens, I try hard not to force it or invent it. If you look at most of my shoots you'll be surprised how many of your favorite shots were captured in between scouting for new locations. Let them play photographer. Kids love to feel involved in grown up tasks - photography is no exception. I love to share the images I've captured with the children I'm shooting. I'll let them press the shutter, look through the viewfinder... maybe not hold my expensive equipment, but I let them get a feel for it. Anything again to distract them from the monotony of picture time! "Where do you want to shoot?" I have my ideas but sometimes I like the child to feel more involved. I'll let them shoot where they want their solo shots. Somewhere they can feel comfortable and something they're interested. Whether it's a rock, a window, a slide - when they feel more in control, they're more willing to work with you! Meltdowns are memorable too. You've seen them - the pictures with the huge screaming mouth, tears down the face, messy hair. As sad as they are, they're also kind of adorable. Sometimes kids just need to cry and get out the frustration of a shoot. A lot of the time they'll be more cooperative once they just get it out. Curiosity killed the cat, not the kid. I love the pictures of kids that are deep in thought, excited with curiosity or looking off into the distance at an animal barking. The images and the emotion behind the eyes are so innocent. The best shots don't always have to be looking into the camera. So - you've read a few of my tricks that I can remember off the top of my head. What are your favorite tricks to get your kids to cooperate for pics?